We may have enjoyed it, but GI Joe: The Rise of Cobra was, at best, a mediocre work. Not as terrible as anyone expected, but not as good as it could have been. It did well enough to warrant a sequel, though, so that means a second chance to get things right. Or is that a second chance to screw things up even more? The greatest American Heroes are back and they've been set up to take the fall for a terrible crime they didn't commit. Now, Roadblock (Dwayne Johnson), Duke (Channing Tatum) and the other GI Joes must once again face their mortal enemy, Cobra, as well as dangerous new threats operating within the government. When all else fails, one option remains: Retaliation. Yes, the plot of Retaliation is basically the same as The A-Team: good guys are framed and need to clear their names. No, it's not the most original premise in the world, but it doesn't need to be. If you're going to complain about Retaliation relying on existing tropes, you'd better be doing the same for every other movie too. We're not here to judge the ideas, but the execution. And the execution is good. Better than Rise of Cobra, that's for sure. Despite the similarly sized casts (the first movie had eight Joes and five Cobras; the second has six Joes and four Cobras), the writing and characterization display marked improvement. There are exceptions, of course - Flint is given pretty much no personality, Lady Jaye's motivation is cliched, and Bruce Willis is just playing Bruce Willis - but all that beats slapstick Ripcord, robotic Scarlett, and a team otherwise full of cyphers. One of the weirdest choices is the RZA as the Blind Master. Yes, he was black in the comics, but he was also American - we know RZA's a fan of Shaw Brothers films (his directorial debut, The Man with the Iron Fists, is basically a love letter to the studio the way Pacific Rim is a love letter to Toho), but he adopts a terribly cheesy accent that makes him sound like Coiffio from Perfect Hair Forever. Seriously, what the hell? Retaliation was only five weeks from its original release date when Paramount unceremoniously announced it was going to be delayed nine months. The official story was that after Battleship sank so hard, the studio wanted to convert the movie to 3D to grab some more of that sweet, sweet box office cheddar. Scuttlebutt was that the real reason was to add more scenes of Duke, since Channing Tatum had become a much bigger star between films. Tatum himself said he hadn't been called back to shoot any new scenes, and yet the rumors persisted. The final product makes it clear that no, no more Duke scenes were added - that delay honestly was only to take the time to do the 3D conversion properly (not that it matters at all once you get to the home video market). The outlandish sci-fi elements from the first movie aren't gone, but they are toned down. For instance, no one is using pulse pistols: all the guns are firing real bullets (with a single exception early in the film). There are no acceletrator suits, and no nanite-infused, mind-controlled soldiers. And best of all, the change seems organic - they're not just ignoring this technology for no reason, there's a logical, in-story reason for both sides being more down-to-earth. That way, when the crazy super-tech does show up, it stands out as something special, not just another spoon in the drawer. Retaliation was directed by Jon M. Chu, an announcement that severely pissed off the fanboys. Not because they were familiar with his work, but because he had the unmitigated audacity to be the guy who directed the Justin Bieber movie. Yes, that was all it took. It's not like any of us had seen any of his previous films (he also directed two of the Step Up sequels), but because he made a documentary about someone it's cool to hate, people were incensed. But think about it: is an action movie really that different from a dance movie? They both need to convey complex physicality clearly, or they become a muddled mess. The action in Retaliation is a lot more close-quarters than it was in Rise of Cobra - more "hand-to-hand," less "submarine shootout" - but it's still easy to track what's going on. The movie pays homage to its roots in subtle ways. Jinx is the pupil of the Blind Master, Roadblock picks up every heavy caliber gun he can find, Lady Jaye uses disguises, and there's an awesome 10-minute stretch with absolutely no dialogue, paying homage to the famous "Silent Interlude" issue of the comic. Fans who were upset by Cobra Commander's appearance in the last film will be pleased to know he's looking much more traditional (and much more intimidating) this time around. Even better, Snakie-Eyes' mask no longer has a mouth! And the uniforms hanging in Joe Colton's closet are all ones that were available for the original 12" doll (yes, in case you didn't realize, General Joe Colton is "the" GI Joe, America's Moveable Fighting Man). So the movie is decent, but it could be better. And if you know where to shop, it is. In one of the most frustrating exclusivity deals yet, Best Buy is home to an exclusive "Extended Action Cut" of the film that's not available anywhere else [Only in the US. It's also on Amazon.co.uk and apparently region-free? --ed.]. You know, it's one thing to have exclusive packaging. Or when Avengers came out and some stores had exclusive bonus discs (with material culled from previous movies). But to get an exclusive director's cut? That's too much. Especially when the new version is a significant improvement. The running time of the standard film is 110 minutes; the running time of the extended cut is 122 minutes. Twelve minutes, and yet they make a world of difference. For instance, in this version, Flint gets a full character arc, rather than just being "guy in shirt." Roadblock is more conflicted, Jinx is more motivated, and other Joes actually do things other than fill in the back of crowd scenes. 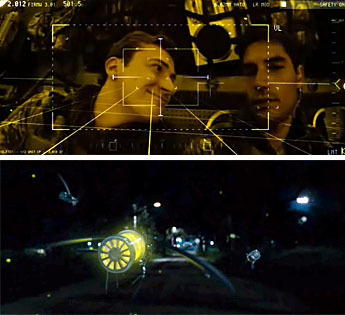 One of the (justified) complaints about the movie was that it felt like a series of random events, a group of sketches with no connective tissue. This version alleviates that a bit, thanks to the reinstatement of a few lines of dialogue during otherwise-unclear transitional scenes. Seriously, if you enjoyed Retaliation, you owe it to yourself to get the extended edition - and if you didn't enjoy Retaliation, you should give the extended edition a shot to see if it fixes your problems. This version should be in every store, not only at Best Buy. Which may be why, when I went to buy it on the afternoon it was released, there were only two copies left. So good luck with that. The Extended edition is only available on Blu-ray, so the image quality is superb. There's perhaps no better test of that than the Himalayan mountain fight: you've got a man dressed in black, standing against white snow, hanging off grey stones, and fighting with people wearing bright yellow and bright red. If any of that goes wrong, you're going to be able to tell instantly, and yet it looks stunning. Of course, the high definition means that you can make out every little crag of the mountainside and the textures of Snake-Eyes' costume (tiny Arashikage symbols, if you're wondering). If you find any flaws in this transfer, it's more likely a problem with your tv than the disc. The audio is presented in 7.1 Dolby TrueHD, and is crazy dynamic. They start showing off the sound range during the opening credits' Paramount logo, and it keeps up right until the end. The deep bass parts are strong, but not to the point where they get crackly. There's obviously a lot of popping gunfire throughout the entire film, but the quieter elements don't get overlooked, either. If you have a fancy surround sound setup, this will be a great way to show it off to your friends. When you put the disc in, you're given the opportunity to "choose your side" - GI Joe or Cobra. The options are the same underneath, it's just a question of which themed menu you'd like to see. The special features begin with three deleted scenes. The first one does a little to set up the return of Storm Shadow, the third adds some context to one of Roadblock's lines, and the second is just a bit of fluff that's funny to see but ultimately unnecessary for the film. "GI Joe: Declassified" is a series of six production documentaries that can be played individually or as one. They cover all the usual topics you expect to see in a making-of doc: casting, production design, stunts, etc. Jon Chu and the writers (Rhett Reese and Paul Wernick, of Zombieland [and Deadpool] fame) talk about what they wanted to do with the sequel without ever directly saying that the first film was a disappointment - it's all very diplomatic. When the interviewees can take a break from praising each other and everything that's been done, we get some very interesting stories, such as Ray Park's admission that since it's so hard to breathe in the Snake-Eyes mask, he prepared by wearing a gas mask while doing his normal exercise routine so that he could get acclimated. They also briefly discuss Roadblock's "battle kata" weapon system, which was featured in the toys but almost entirely removed from the movie. It would have been nice if they'd actually acknowledged/addressed the controversial delay, but they're probably hoping that in five years we've all forgotten it ever happened. Ironically, one thing you do lose out on when you buy this director's cut is the director. The standard release has a commentary track with Jon M. Chu and producer Lorenzo di Bonaventura, but it's nowhere to be found here - not even on the second disc, which is a plain DVD copy of the theatrical release. What a bummer! 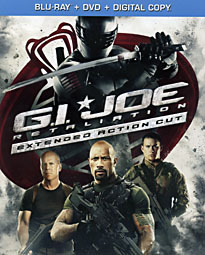 Even with the extra 12 minutes of footage, GI Joe: Retaliation is still not a great film. The argument could be made that it's merely on par with the first film, but even if it is, it's still a step in the right direction. It doesn't try to pretend Rise of Cobra never happened, it adroitly keeps what worked and discards what didn't.